The sim’s park, coonoor came into existence in the year 1874. Not satisfied with the panorama of the natural beauty of the sustained forest scattered all over length and breadth of these hills, Hon’ble J.D. Sim, the then Secretary to Govt. and Major. Murray, the then Superintendent of the Nilgiris forests have planned and laid out in an orderly fashion in a central place for themselves and the future generations this fine and exhilarating rendezvous park which was rightly christened as sim’s park after the former. Though originally conceived as a pleasure resort for the residents and visitors, the park has now further taken upon itself the additional functions and trial of various exotic species of systematic and economic importance. Location Dist/ Taluk /Block – This park is situated in deep ravine, 3 km to the north of Coonoor Railway Station. It extends to an area of 0.85Ha and forms the entrance of the park. The flower beds are neetly laid out in such a way that they merge with the landscape. It has got a small hemispherical lawn made up of kikiyu grass in frent. A carpet bed with ashoka piller at the center adds the charm to the lawn. The two Bougain villa orachs on either side of lawn pave way for visiting the inner component of the park. Nearly 80 tree species and shrub species of different families can be seen. Acacia ducurrens,Eucalyptus ficifolia ,Agathe’s robusta,Hymemospermum,Ternsfroemia japonica are some of the above species. Quercus sessilifloia,cinnamomum camphora,podo-carpus taxifolia,Bucklandia populnea are the old trees planted in the year 1980. It comprises of an area of 0.42Ha.A Summer House is situated at the center on the flowers beds are formed. Symmetrically on either side of the summer house.A well maintained Azalea hedge and shrubbery are the distinguished features of the section.It amoonts 38No of different trees and shrub species of various families. Some of them are Cedrella toona, Dracaena reflexa, Elaeocurpus ganitrus, Araucaria bidwilli, Sauraia nepalensis, Araucaria cookii, Camellia japonica, Magnolia grandiflora, Prunus pissandii, Pieris owalifolia, Eucalyptus amygdalina, Cinnmomum camphora, Juniperus sedfordiaha and Thuja filiformis. Among them the ‘Araucaria bidwilli’ is the oldest tree planted in the year 1885. It consists of an area of 1.39Ha.There are about 92different species of trees and shrubs hailing from different families. Photinia lindleyana, Glochidon ellipricum, Vaccinium leschenaultii, Acer laenigatum, Rhododendron arboreum, Eugenia calophyllioocia, Ilex wightiana, Macararga indica, Prunus puddum, Meliosma arnottiana, Peltophorum abricanum, Diospyros Virginiana are some of the tree species in the IIIrd section. Among them phofinia lindleyana in the oldest tree planted in the year 1889. It is consists of an area of 1.08Ha and the area is almost formed a green patch due to the presence of kikigu grass. A good view of the park especially the Iland area, Pondshola areas of the park can be seen from this section. Nearly 71Nos of different trees and shrubs flower in at different seasons are the distinguished features of the park. Cotoneaster frigid, Arbuts rollionsii, Eucilyptus robusta, Casuarina marginata, Nerium oleandes, Cupressus obtusa, Hypericum mysorensis and Sehima wallichi are some of the trees in the section. It extends to an area of 1.38Ha and forms the topmost terrace of the tennis garden. It accounts for 45Nos of different tree and shrub species of which Quercus sessiliflora is the oldest tree planted in the year 1880. Michelia champaca, Albizzia falcate, Laurus nobilies, Betula alnoides, Rhus succedanea, Sophora glance, Tristkaia conferta, Alnusnepalensis are the important trees to be seen in the section. It covers an area of 2.2Ha and claims the biggest section among the 8 section. It starts from the north east portion of the park and ends in the south west side. Nearly 120varieties of different kinds of tree and shrub species belonging to different families can be seen in this section. The two Eucalyptus eugenoides trees planted in the year 1880 are the most distinguished features of the park. The other important trees are Eugenia Calophyllifolia, Celtis serofina, Golchidon ellipticum, Vaccinium leschenaultia, Pinus lorgifolia etc..The tennis garden with beautiful blue grass lawn surrounded by nearly 1000Nos of rose plants adds the charm to the section. It forms the area around the Island garden and claims an area of 0.90Ha.After the construction of stone structure in the Island, the section is conveniently divided into two portions namely Island garden and small Island garden. 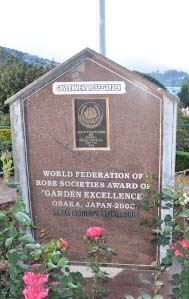 The rose plants of different groups viz Hybrid teas, Floribunda and Polyanthe types are planted in such a way to give pleasant appearance to the visitors. The phonix canariensis and Bambusa with there receiptocals make the visitors to feel it as an Island. Vaccinium leschenaultii planted in the year 1895 is the oldest tree in the section. The two-day fruit show is conducted in Sim’s Park, Coonoor during the last week of Saturday, Sunday of May. The event is organized by the Department of Horticulture and has been held annually for 56 years. It attracts about 25,000 attendees.